Window Performance Ratings: What’s in an NFRC Label? You see them on those little black-and-white stickers on windows and read about them on flyers and catalogs – things like Solar Heat Gain Coefficients and Visible Transmittance. You hear your window dealers refer to them as NFRC ratings. But what are these ratings for and how can they help you, as a homeowner, look for replacement windows in Detroit? 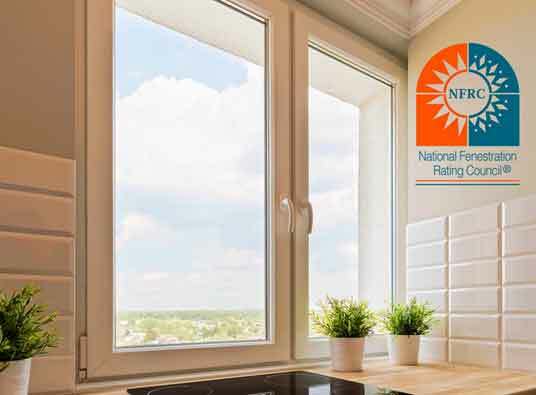 The National Fenestration Rating Council (NFRC) is a nonprofit organization that empowers consumers who are in the market for energy efficient doors, skylights and windows. In addition to publishing consensus standards (for consistent ratings), NFRC administers a third-party certification and labeling program to provide the window buyer with verified product information. This is where the NFRC labels come in. They function as fact sheets that helps customer decide, at the point of purchase, which windows in Detroit they should buy. U-Factor measures the heat from inside that can escape through the product. U-Factor ratings fall between 0.20 and 1.20. A lower number means lower potential for wasted heating expenses. Solar Heat Gain Coefficient (SHGC) measures the amount of outdoor heat that can enter a room, and is expressed as a number between 0 and 1. The lower the SHGC, the better the product is at blocking heat gain and the lower the potential for wasted cooling expenses – an important factor if the weather is predominantly hot. Visible Transmittance (VT) measures how much natural light can come into the room, and is also numerically expressed between 0 and 1. The higher the number, the more natural light is let in. If you prefer a particular room relatively dark, choose a lower number. Air Leakage (AL) measures how much air enters a room through the product. AL rates are numerically expressed between 0.1 to 0.3 – the lower the number, the better it is at keeping drafts out. Note that this is an optional rating (unlike the other three which are all required to meet Energy Star® requirements) and may sometimes not appear on NFRC labels. Knowing how to read the values in NFRC labels can help you decide what kind of windows to get for your replacement windows in Michigan. For instance, if you need more daylight but less heat, choose a window that has a high VT and low SHGC. This also helps you compare the same performance values across different brands. If you wish to know more about the further benefits of NFRC ratings, call us at (844) 714-7268. Kroll Construction will be glad to answer your questions and help you do what’s best for your home.